Any quality leader should strive to lead with a servant heart set on fulfilling a term of service. As I have these unbelievable 365 days ahead of me, I hope to approach each day with the same zeal to elevate FFA members to their highest capacity as the day before. We are here for each of you, and I simply hope to be a listening ear and stepping stone in your undeniable path to success! While I could easily deem many individuals as the one who inspires and motivates me, I believe an open-ended answer is more genuine. Every interaction, conversation and connection to FFA members, the backbone of this organization, pushes me to be better and to be more. You will never know just how inspirational and impactful you are! Throughout high school, my future plans have often changed, but I believe I have truly found my passion in animal science. I am intrigued by agriculture communications, animal science and journalism, but ultimately I know whatever route I choose will be in this wonderful industry. No matter my career, I hope to always be able to serve as a mentor to the youth of ag as so many have done for me! 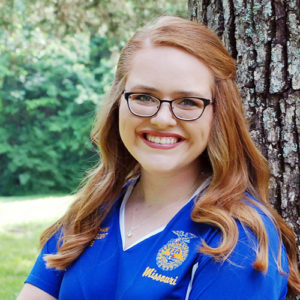 Enrolling in agricultural education courses and zipping up my blue jacket freshman year marked the first time in more than 60 years that the FFA was brought back to life in my family tree. My grandfather, Ralph, was a member of one of the earliest membership groups the Eldon FFA had. Raising my show goats on the same land he once grew diversified agricultural products on is such a rewarding and humbling thought! Cherish every given moment. Whether you are a freshman gazing upon four full years ahead or a senior who sees the light at the end of this journey, always make the most of every experience provided to you. As a freshman, I thought that I could always wait until the next year to do a FFA activity like camp or a career development event, but time is short. Don’t run out of tomorrows and next years in the blue jacket. Soak it up. Let your light shine bright and unapologetically!